Historically, Foreign policy hasn’t won an election for anyone. Yes, one could point to the Falklands War with Argentina and how it helped Margaret Thatcher win the 1983 election. But it will be hard to forget that Winston Churchill lost the 1945 election by a landslide months after he had won a World War. Also, Harold MacMillan for the Conservatives won the next election after the Suez Crisis that had happened in 1956 under a Conservative Government (albeit a different Prime Minister in Anthony Eden) and that had humiliated us more than almost any other crisis in our history. People in this country feel very strongly about a lot of foreign affairs, but it does not seem to be an issue that affects their vote. Which might be why the mainstream political parties are being so quiet about foreign policy now. There are people dying on boats in the middle of a calm Meditteranean Sea trying to escape Africa to get to Italy and Labour and Conservatives, at this point in the campaign, seem to be just wishing it away. This despite the complicated policy options that the UK, as a liberal democracy, really should be looking to be a part of. The Conservatives are worried about being seen to want to do the right thing by these migrants. 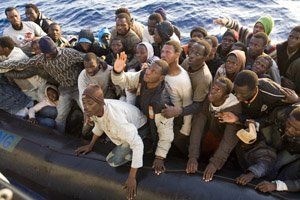 They are desperate enough to leave the Northern tip of Africa, risking life and limb to get to Europe. They are escaping countries such as Eritrea and Somalia in search of safety as Islamic State deepen their grip across the East Africa. The right thing would be to offer them asylum here, whether they are coming here to get security or coming here to get a job or for a new beginning. But will you hear David Cameron saying anything like that? Or will he be so worried about the hay that UKIP would make of a suggestion like that, humane as it is, that he won’t do it? You bet he won’t. Add to that where the migrants are setting sail from. David Cameron told the Libyans when Colonel Gadaffi was removed in 2011 that the UK would stand with them shoulder to shoulder as they built a democracy. As often happens when you completely destabilize a country, democracy hasnt been built. Instead, factions battle and Islamic State fill the void. That’s not to say we weren’t right to intervene as Gadaffi and his henchmen planned a massacre to end all massacres in Benghazi, but I don’t think we imagined we would have no Embassy there, and be just standing by as, for instance, Islamic State line up rows of Egyptian Coptic Christians on a beach and behead them. As we, I was hoping, found out in Iraq, you have to have a proper plan for after an intervention, not just a plan for the intervention. Not that Labour has much to say on all this. Ed Miliband repeated his distortion of the truth about “Standing up to the a Leader of the Free World” on last week’s debate as he reminded us that Labour led a vote against intervention in Syria in 2013 in order to prevent more of Assad’s atrocities. It was a distortion as witnesses insist he agreed to support the invasion then ‘changed his mind’ under pressure from the left of his party. But no matter, getting back involved in Syria and then Iraq might have stopped Islamic State from establishing, well, an Islamic State. OR, removing Assad would have brought in Islamic State quicker. We’ll never know now. So, both mainstream parties will be as quiet as they can about Foreign Affairs. There may be debate in it, including the amount we spend on defence. But there aren’t votes in it. Shame, because it affects all of us. Now, and in the future. « Are the CMA concerned that Poundland will buy 99p Stores then become the £1.01 store? Rather controversial: “Falklands War in Argentina”. Perhaps warranting an edit replacing “in” by “with” ?